The May 2017 Meetup of The Windows Developer User Group is scheduled for May 15th from 6-8 PM @ Improving Ohio Office. Please see details below & kindly RSVP. Code Checkup: Tools to check the health of your code! Over time even the simplest project can grow into an unwieldy beast. Features are added and removed. Developers come and go. Using static analysis tools we can get an idea about what challenges are in store for us. 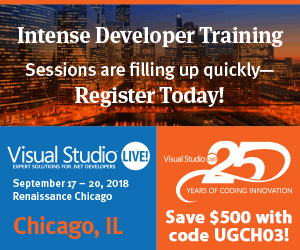 We will discuss how ReSharper, SonarQube and other tools can be used to expose any issues that may exist in our code base. This can help provide a fresh set of (computer) eyes to help keep your code base from becoming a toxic dump. Doug Mair – Doug is a Principal Consultant at Improving Enterprises in Columbus Ohio. He started developing software as a high school freshman on a TRS-80 16K. He loved programming so much that he decided to get a BSCIS from Ohio State University. Since then he has developed software for Graphics Kiosks, Rules Engines, Specialized Hardware and ASP.Net websites. Over the last several years, he has helped grow the Windows Developer Community in Central Ohio. He spends his free time developing Windows applications and Unity games.